Think spring! Think warmer weather! Think mountain biking! Think CRAMBA! With the cold weather, snow and gray skies almost behind us it’s time to put that fatbike away and dust off your 29er, 650b or that rockin’ 26er! Of course, some of you ride fat year round, so tune that fatty up and keep her rollin’ this summer (and join us on one of our group rides). So you’re ready to head to your local trail… thankfully it’s ready to ride thanks to your CRAMBA-IMBA chapter! Or maybe you’re ready to head to a brand new trail. Thankfully, it exists due to the efforts of your CRAMBA-IMBA chapter! How does this all happen? It’s simple: members like you drive the mountain biking experience in concert with CRAMBA-IMBA! By becoming a CRAMBA-IMBA member you support building and improving your local trails. And more members means more weight for getting what we want, which means better trails and more trails. Still not sure why you would want to be a member? Our members dictate what we want and do. Member counts bring us clout with our local parks, government, and land managers which gets us what we want: new and improved trails. Membership pays chapter expenses: supplies for building and maintaing trail, insurance for the work we do, events we put on. There are no additional obligations when becoming a CRAMBA-IMBA member. 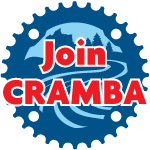 If that’s not enough for you, CRAMBA-IMBA is launching a Spring Membership Drive running March 2016 until May 2016 to encourage you to join your CRAMBA-IMBA chapter! Running March through May, the drive will include special prize opportunities donated by a variety of corporate sponsors and limited edition IMBA gear for all individual and family members who join or renew their membership or register with CRAMBA-IMBA. Look for an upcoming announcement about the 2016 benefits for new and renewing members. Join here: I want to join CRAMBA-IMBA! Or here: IMBA. Visit our Facebook page; we look forward to seeing you on the trails and at one of our upcoming events. Ride on!